State Sen. Mike Stack today presented resolutions to five Holocaust survivors from throughout Pennsylvania during the commonwealth’s annual Holocaust commemoration at the state Capitol. “The atrocities that took place at the hands of the Nazi regime are unfathomable; that these horrifying and tragic moments took place in modern times is even more unsettling. Hatred is like an untreated wound in our society: it festers until it infects an entire nation, much like Hitler’s final solution,” said Stack (D-Philadelphia). “This ceremony recounts the horrors of the Holocaust every year. But, it does much more than that. It inspires us to do better; to stand up to injustice and hatred and to never forget the Holocaust victims; to teach our children important lessons; and, it unites us to say, ‘Never again’,” he said. Stack thanked the survivors who received resolutions during the observance, including Freda Lederer, Rose Machelmacher of Harrisburg; Fira Kaganovsky of York; Sam Rosen of Scranton; and David Tuck of Philadelphia. “Thank you for your bravery. Thank you for being a great example orf courage and perseverance. You teach us how to turn horrific tragedy into actions that make our communities, our commonwealth, our nation and our world a better place to live. We are blessed to have you,” Stack said. 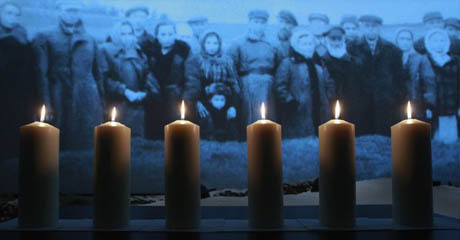 Designating April 7 through 14, 2013, as “Days of Remembrance of the Victims of the Holocaust” in Pennsylvania. RESOLVED, That the Senate designate April 7 through 14, 2013, as “Days of Remembrance of the Victims of the Holocaust” in Pennsylvania, in memory of the victims of the Holocaust in the hope that we may strive to overcome prejudice and inhumanity through education, vigilance and resistance.